2018 Tribute to Learning Winners! Greater Las Vegas is the ATD Chapter of the Month! You probably know the next Olympic games will take place in 2020. But when do athletes get ready for the event? Certainly not at the last minute. If you want your team members to have even a chance to reach for the gold over the next 12 months, what are you doing this year to help them be ready? Perhaps an even better question is, what can the ATD Greater Las Vegas chapter do to help you? This year we are launching 6 targeted sessions designed to "Empower Professionals to Develop Talent in the Workplace." Our 2019 programming calendar is packed with events that will help you and your teams reach or even surpass your performance goals for the next 12 months. Each session is full of practical information you can use today, along with resources, references and tools to take along. 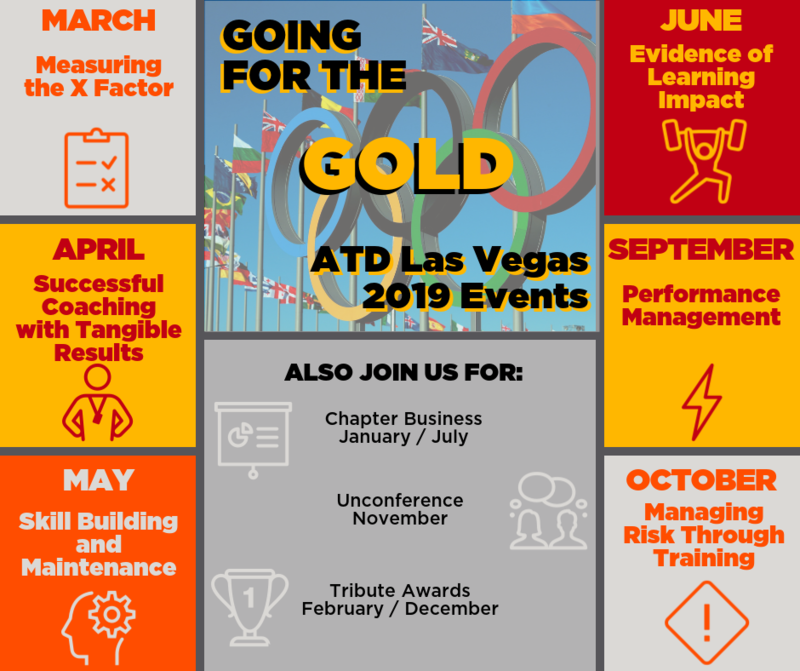 Whether you're part of a global learning organization or one a one-person HR department, trainers, designers and managers alike will find value in "going for the gold" with ATD Greater Las Vegas in 2019!